The innovation designed into the Stampede 4X4 begins with a chassis that won't flex under load for arrow-straight, hard-charging acceleration. The chassis fully integrates the electronics and battery compartment for an efficient and compact layout, and maintains the high center ground clearance that gives Stampede 4X4 its tall stance and high-riding look. The extra clearance dramatically increases the off-road versatility that allows you to tackle rough terrain and large obstacles. The Stampede 4X4 feels planted and secure at speed, even on pavement and in other high-grip conditions. Stampede 4X4 is 100% monster truck, but it handles like a racing machine! Underneath, the chassis is ultra-smooth to reduce drag and prevent snags driving through brush. 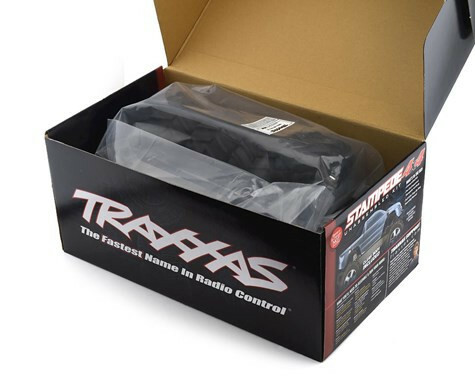 The Stampede 4X4 Kit includes a fully waterproof receiver box for your receiver (sold separately). Only Traxxas’ patented innovation gives you the freedom to tackle creeks, snow, and mud without worrying about water in your electronics. The soft-compound Chevron Maxx™ tires maximize performance for all-terrain traction. On dirt, the treads claw for traction, providing superior forward bite and massive roosts, and on pavement, the forgiving side grip allows the tire to power-slide while maintaining a sure-footed neutral feel. Chrome All-Star Wheels The Stampede 4X4's 2.8" All-Star™ chrome wheels feature a horizontal bead configuration that holds the tire to the rim even under extreme rpm. Performance-designed foam inserts come standard in the kit. High-speed off-road action requires rugged, responsive shocks that can take a lot of abuse. The Ultra Shock's high-volume body yields large oil capacity, and a silicone bladder separates oil from air within the shock for consistent damping action, even during all-day off-road sessions. Dual X-ring seals give super-smooth performance without weeping or leaking, and Ultra Shocks are fully tunable with a wide range of oils, springs, and pistons. The springs feature an optimized spring rate for responsive handling and the long-lasting white powder coated finish sets the Stampede 4X4 apart from the pack. Stampede 4X4 has huge amounts of seemingly bottomless, ultra-plush suspension travel for suspension action that swallows up jumps and delivers incredible rough-track control. 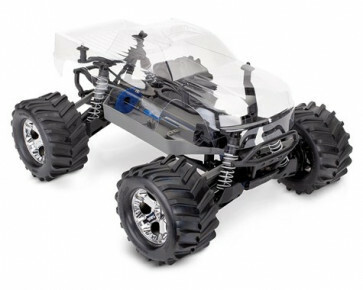 The fully-optimized front axle carrier is a result of computer modeling that allowed engineers to design for maximum articulation without binding or interference. Tight steering response is always there, even at the extreme ranges of the suspension travel. Double-shear tie rods and camber links simply can't pop off, so you always stay in control. Robust construction wards off crash damage, and oversized 10x15mm inboard bearings and 5x11mm outboard bearings are incredibly durable and smooth. 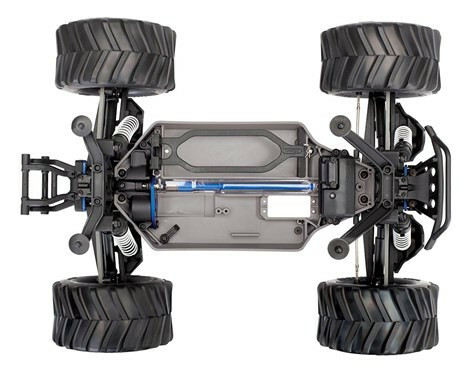 Stampede 4X4's telescoping, universal-joint driveshafts allow for maximum suspension movement resulting in longer travel and tighter turning. Extra material and design tweaks greatly increase torque handling. No part of Stampede 4X4 was overlooked in the quest for durability, precision, and performance. The dual-bellcrank design pivots smoothly in the harshest conditions, and an integrated cam-type servo saver protects steering servos from crash impacts without sacrificing steering precision. 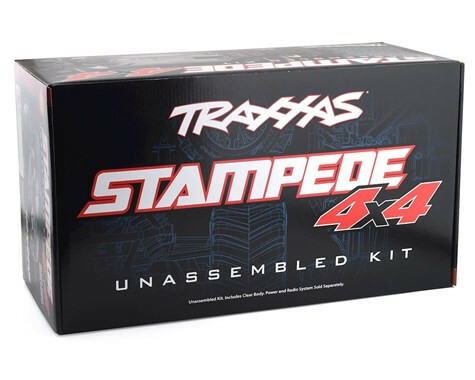 Extreme brushless horsepower is never an afterthought at Traxxas. The Stampede 4X4 driveline is built to handle power for today and accommodate future power upgrades down the road. The spur gear features rugged 0.8 module/32-pitch teeth for total reliability no matter how much power you pour on. Stampede 4X4's tough 3mm steel turnbuckles have broad flats that make it easy to set toe-in. Both the steel turnbuckles and composite camber links feature captured rod ends that won't pop off during rigorous off-road pounding. The Stampede 4X4's patented slipper clutch uses semi-metallic friction material and finned aluminum alloy pressure plates to dissipate heat and provide consistent traction control. The slipper adjusts easily without disassembly or removal, and the unique 3-pad design is proven rugged in Traxxas' most powerful vehicles. It's also the perfect complement to Velineon brushless power, offering the ultimate in traction control.